I just added another blog to my “blogroll” section on the right hand side. The website is called Free Good News. I’ve read some of author’s (Bernie Dehler) articles before on his website, and would have loved to add him before, but i didn’t realize until today that he published his articles in a blog format. He writes about many of the same issues in the church that this website is concerned about. The main thing is he is a voice against the tithing mandate as well. 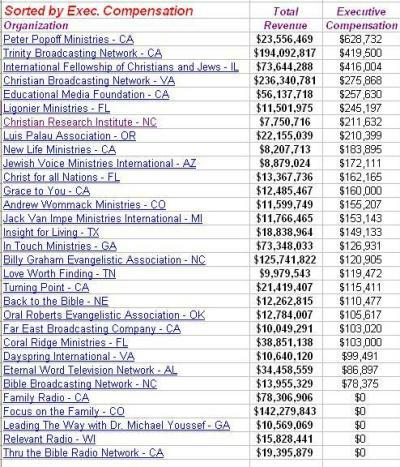 What brought his website to my attention today was an article that he had posted, “2008 Salary Review of the Top 20 Christian Ministries”. He posted a list of some financial figures. Go to his website to find out the details but here is a screenshot summary of the finances. So what are your thoughts on the numbers here? My first reaction is that’s a lot of money, i wonder where it goes? By the way does anyone know of any other Christian, financial/stewardship blogs out there? Thanks for posting the link to my article. What should a Christian CEO be paid?